Title Tthe bailout:plan: the details published to cocoa-touch. In particular, the plan would include both a program to purchase bad assets and an insurance program to underwrite others. It would also require the government to be given company stock in return, ensuring that taxpayers would make money once the assets regained some value. And the deal would also require curbs on executive pay and the $700 billion to be released in installments. 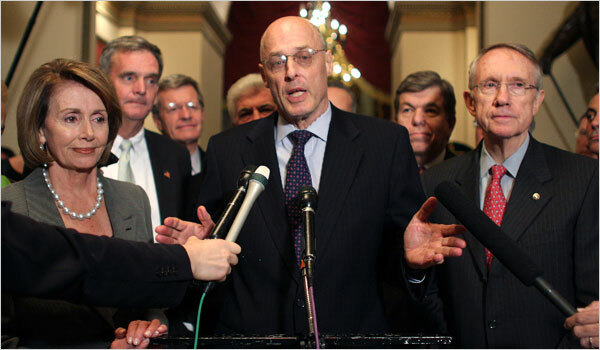 "I think we're there," said Treasury Secretary Henry M. Paulson, joined by congressional Democrats and Republicans at a post-midnight news conference at the Capitol. Party leaders still need to present the agreement to their rank and file, but with leaders of both parties appearing together after marathon talks, the agreement stands a good chance of passing Congress and getting President Bush's signature within a few days. "We've made great progress," House Speaker Nancy Pelosi (D-San Francisco) said. "We have to commit it to paper so we can formally agree." The plan still faces fierce opposition from House Republicans and Democrats angry at what they say is a taxpayer bailout of Wall Street "fat cats." As the House opened for an unusual Sunday session, lawmakers from both parties rose, one after another, for one-minute speeches denouncing the agreement -- and signaling a continuing struggle as policy-makers and their staff work out the final details. 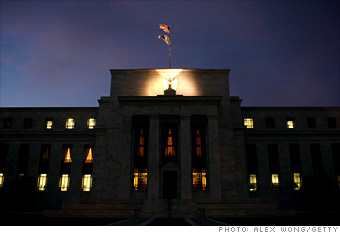 The administration had initially requested virtually unfettered authority to operate the bailout program. But as they moved toward clinching a deal, both sides appeared to have given up a number of contentious proposals, including a change in the bankruptcy laws sought by some Democrats to give judges the authority to modify the terms of first mortgages. A senior administration official, who requested anonymity to speak freely about the plan, said both sides had made significant concessions to achieve compromise. 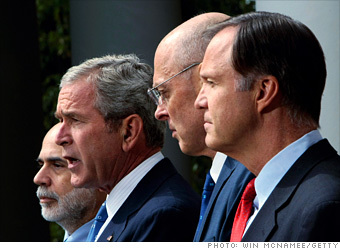 The Bush administration has agreed to accept a number of Democratic demands, including: · The money would be dispersed in segments, with Paulson receiving $250 billion immediately, $100 billion upon White House certification of its necessity and the final $350 billion only after Congress has been given 15 days to object. · Firms participating in the bailout would be required to grant the government warrants to obtain nonvoting shares of stock, so taxpayers can benefit if the companies return to profitability. 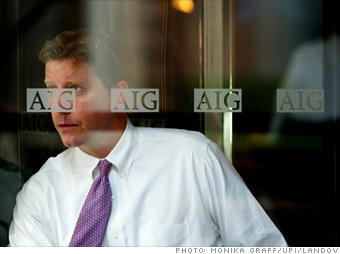 · Firms taking advantage of the bailout would be required to limit compensation for senior executives, with especially severe limits on "golden parachutes" at failing firms. The compensation limits will be enacted primarily, but not solely, through the tax code by reducing tax deductions for firms that pay executives more than $500,000 a year. The administration also agreed to Democratic demands that the financial services industry should help pay for the program. Under the agreement, the president would be required to propose a fee on the industry if the government has not recovered its money through sales of the assets within five years. Democrats also made a number of concessions, abandoning demands that bankruptcy judges be empowered to modify home mortgages on primary residences for people in foreclosure. They also agreed not to dedicate a portion of any profits from the bailout program to an affordable housing fund that Republicans claimed would primarily assist social service organizations that support the Democratic Party, the official said. Meanwhile, House Republicans won a major victory, persuading negotiators to include a provision that would require the Treasury Department to create a federal insurance program that would guarantee banks and other firms against loss from any troubled asset, the official said. The plan to rescue the U.S. financial markets was first advanced by the Bush administration in a late-night meeting with lawmakers just 10 days ago. Under the proposal, Paulson would be authorized to purchase mortgage-backed assets from struggling firms in hopes of easing a credit crunch that has pushed global markets to the brink of collapse. With home prices plummeting, many of those assets are now almost worthless, and investors have lost confidence in many of the firms that hold them. That has undermined some of the biggest names on Wall Street and caused banks to stop lending money, sparking a credit crisis that threatens to deliver a devastating blow to businesses, consumers and the broader economy. Administration officials have stressed that the ultimate cost of the bailout would be much less than $700 billion because the government would eventually sell the assets it purchased and recover most, if not all, of its investment. Yesterday's talks, conducted mainly in Pelosi's suite of offices on the second floor of the Capitol, were focused heavily on how to cover the cost of the program so taxpayers don't get stuck with the bill. "We believe that the taxpayer should not be left holding the bag at the end of the day, and we've proposed a way to address that," said Rep. Chris Van Hollen (D-Md. ), a member of Pelosi's leadership team. Democrats said there were no outstanding issues remaining, but that negotiators need to see the words on paper before they can sign off on the plan. "It's really a question of seeing what we believe we've agreed to," said Sen. Christopher J. Dodd (D-Conn.), chairman of the Senate Banking Committee. Even strong opponents of the plan said they expected it to pass. Sen. Richard C. Shelby (R-Ala.), the senior Republican on the Senate Banking Committee, who has refused to participate in the talks, said a "critical mass" was forming behind the measure because of fears that Congress's failure to act would cripple financial markets and devastate the economy. Yesterday's negotiations, which began shortly after 3 p.m., were at times tense and confusing, according to participants. 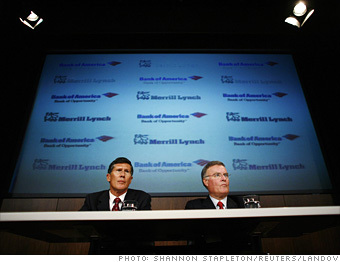 At one point, according to Sen. Kent Conrad (D-N.D.), one senator sought advice from investor Warren E. Buffett, one of the world's richest men and a director of The Washington Post Co. From 3 p.m. to 5:30 p.m., Conrad and other lawmakers met with Paulson around a massive table in Pelosi's conference room under an ornate portrait of Abraham Lincoln. Among lawmakers, Democrats outnumbered Republicans nine to two, an imbalance that so irritated Paulson that he called and complained to Senate Majority Leader Harry M. Reid (D-Nev.), according to three GOP sources familiar with the call. Reid told Paulson he would not pull any of his colleagues out of the meeting. A Reid spokesman, Jim Manley, said: "If the secretary doesn't like it, that's just too bad, because he is going to need the help of each and every one of them to sell the president's plan to the Democratic caucus and the American people." After a break for dinner, the sides scattered into at least three separate groupings -- Paulson huddled in House Minority Leader John A. Boehner's office with other GOP leaders, Democrats in Pelosi's conference room and Pelosi in a separate suite talking with other Democrats. Rep. Rahm Emanuel (D-Ill.) and Pelosi's chief of staff spent a couple of hours in shuttle diplomacy, frantically walking from room to room carrying sheets of paper. Conrad, the chairman of the Senate Budget Committee, said the negotiators were "shopping language" of the bill's draft versions. He and Rep. Barney Frank (D-Mass. 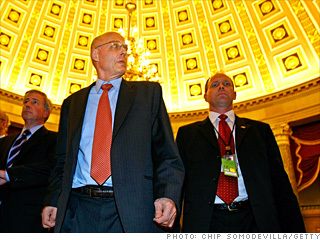 ), chairman of the House Financial Services Committee, also spent time in Boehner's office with Paulson. By 11 p.m., the three groups had once again converged in Pelosi's office to strike a final deal. Yesterday's focus on limiting taxpayer exposure may help rally support in Congress, where lawmakers have been reluctant to back the hugely expensive and unpopular bailout measure less than six weeks from the November elections. But it could unnerve Wall Street, where investors are seeking the largest possible program with the fewest strings attached. They also hope lawmakers approve it before tomorrow's opening bell. In his public testimony and private remarks, Paulson has repeatedly emphasized the need to spend $700 billion to soothe nervous markets. At that price, the government's upfront investment in the rescue package would be more expensive than the current cost of the Iraq war, which stands at about $650 billion, according to the Congressional Research Service. But the White House and politicians on Capitol Hill have said the government could earn back much of its money, or even turn a profit. "Many of these assets still have significant underlying value, because the vast majority of people will eventually pay off their mortgages," President Bush said yesterday in his weekly radio address. "In other words, many of the assets the government would buy are likely to go up in price over time. This means that the government will be able to recoup much, if not all, of the original expenditure." Bush attempted to address criticisms from the right and left that the plan would bail out irresponsible financiers while doing nothing for regular Americans. Echoing frequent comments by him and his aides, Bush said allowing Wall Street to collapse further would pose greater dangers to the economy, perhaps triggering a "deep and painful recession." 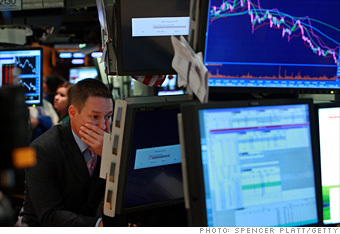 "The rescue effort we're negotiating is not aimed at Wall Street -- it is aimed at your street," Bush said. "And there is now widespread agreement on the major principles. We must free up the flow of credit to consumers and businesses by reducing the risk posed by troubled assets." Democratic leaders have emphasized to rank-and-file members that Paulson has told them that he could only spend about $50 billion a month on the securities purchase program. Of the $700 billion figure, House Majority Leader Steny Hoyer (D-Md.) said: "Nobody believes that's going to be the final cost." Congressional leaders and Treasury Secretary Henry M. Paulson Jr. emerged from behind closed doors to announce the tentative agreement at 12:30 a.m. Sunday, after two days of marathon meetings. “We have made great progress toward a deal, which will work and be effective in the marketplace,” Mr. Paulson said at a news conference in Statuary Hall in the Capitol. In the final hours of negotiations, Democratic lawmakers, including Representative Rahm Emanuel of Illinois and Senator Kent Conrad of North Dakota, carried pages of the bill by hand, back and forth, from Speaker Nancy Pelosi’s office, where the Democrats were encamped, to Mr. Paulson and other Republicans in the offices of Representative John A. Boehner of Ohio, the House minority leader. At the same time, a series of phone calls was taking place, including conversations between Ms. Pelosi and President Bush; between Mr. Paulson and the two presidential candidates, Senator John McCain and Senator Barack Obama; and between the candidates and top lawmakers. “All of this was done in a way to insulate Main Street and everyday Americans from the crisis on Wall Street,” Ms. Pelosi said at the news conference. “We have to commit it to paper so we can formally agree, but I want to congratulate all of the negotiators for the great work they have done.” In a statement, Tony Fratto, the deputy White House press secretary, said: “We’re pleased with the progress tonight and appreciate the bipartisan effort to stabilize our financial markets and protect our economy.” A senior administration official who participated in the talks said the deal was effectively done. “I know of no unresolved open issues for principals,” the official said. In announcing a tentative agreement, lawmakers and the administration achieved their goal of sending a reassuring message ahead of Monday’s opening of the Asian financial markets. Lawmakers, especially in the House, are also eager to adjourn and return home for the fall campaign season. Mr. Obama and Mr. McCain both expressed support for the rescue package early on Sunday, while adding that it was hardly a moment for taxpayers to cheer. “This is something that all of us will swallow hard and go forward with,” Mr. McCain said in an interview on ABC’s “This Week.” “The option of doing nothing is simply not an option.” Mr. Obama, in a statement, said: “When taxpayers are asked to take such an extraordinary step because of the irresponsibility of a relative few, it is not a cause for celebration. But this step is necessary.” The backing of the presidential candidates will be crucial to Congressional leaders seeking to generate votes for the bailout plan among lawmakers, especially those up for re-election in November. The general public has bristled at the notion of risking $700 billion in taxpayer funds to address mistakes on Wall Street, and many constituents have urged their elected officials to vote against the plan. Among the last sticking points was an unexpected and bitter fight over how to pay for any losses that taxpayers may experience after distressed debt has been purchased and resold. Democrats had pushed for a fee on securities transactions, essentially a tax on financial firms, saying it was fitting that they contribute to the cost. In the end, lawmakers and the administration opted to leave the decision to the next president, who must present a proposal to Congress to pay for any losses.